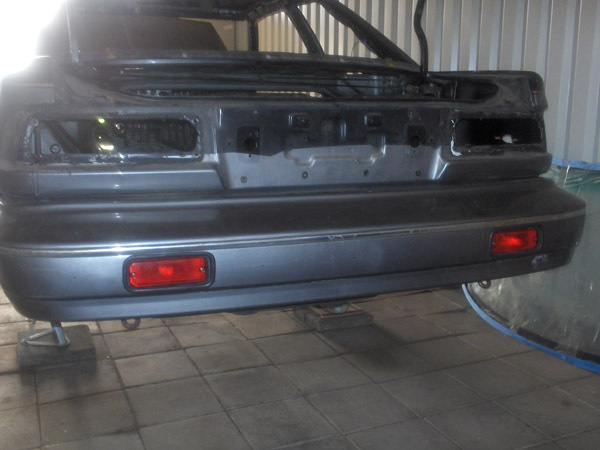 The USDM Toyota Corolla GT-S coupé models weren't fitted with rear fog lights as standard. They weren't mandatory back then and as thus, when the car was imported in to The Netherlands they didn't need to be fitted (They became mandatory in The Netherlands from 1997 and on). 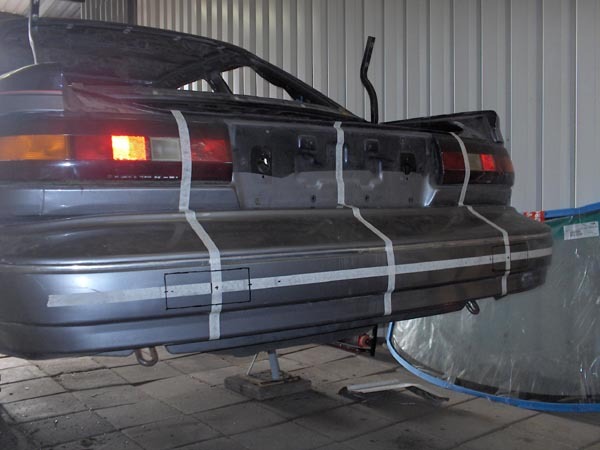 When I started this project and thought I was going to drive the car regularly, I wanted to have fog lights in the rear as a safety precaution. And it would make my car stand out just that little more from other Corolla Coupé's. 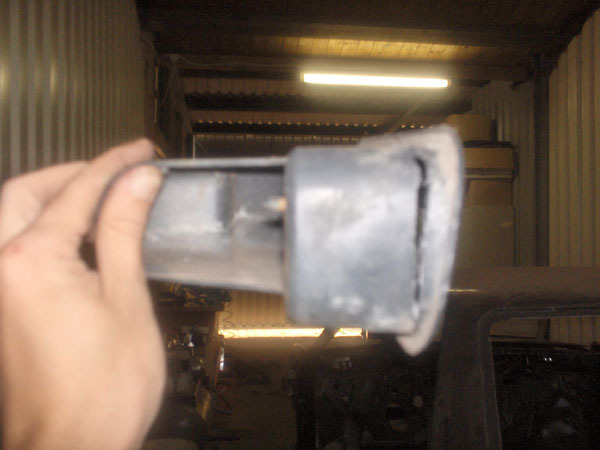 But when the plans changed and the JDM rear bumper came into play, this whole idea was scrapped. But I still wanted to show you guys what I had planned and what I already did to modify the car for these lights. There was no option to incorporate any fog lights into the rear lighting units. So I would need a separate light. It would be easiest to incorporate those into the rear bumper. 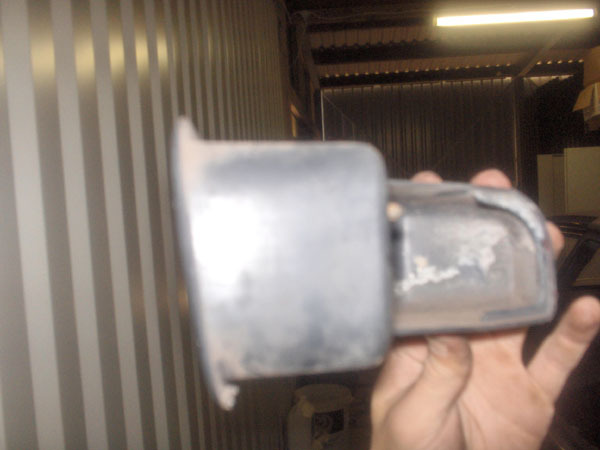 So I looked around at the local scrapyard and for suitable lights that were not to big and could be used as fog lights. My eye was caught by a Honda Civic that actually had a fog light in it's bumper. They were not that big and at first glance, they looked like they would fit the Corolla bumper too. 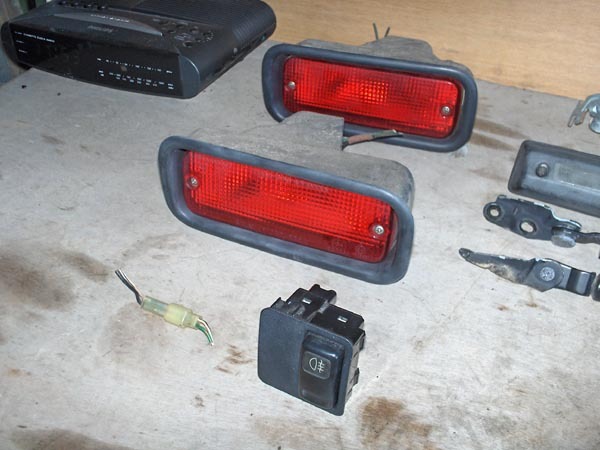 So I stripped that Civic of it's lights and took them with me. And because I'm a sucker for symmetry, I took two while I was at it. A Corolla E9 that was sitting there as well supplied me with the rear fog light switch I could use to switch the lights on and off. 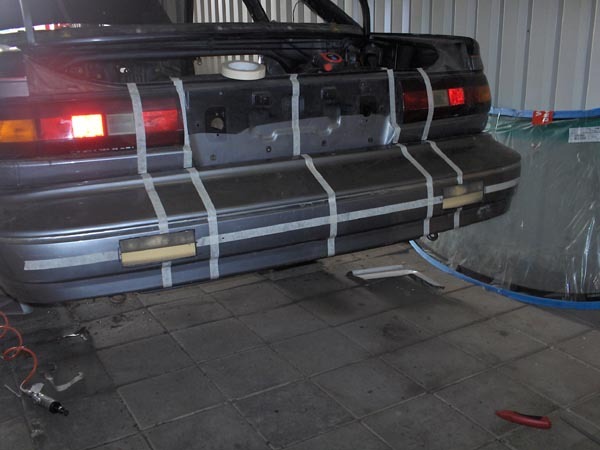 It was very tricky to determine where the light would have to be build into the bumper. But with the help of some masking tape I managed to get some lines on the bumper where I would need to cut the outer cover. As is always the case with any modification I make to the car, I aim to make it look as if Toyota put it there in the factory. 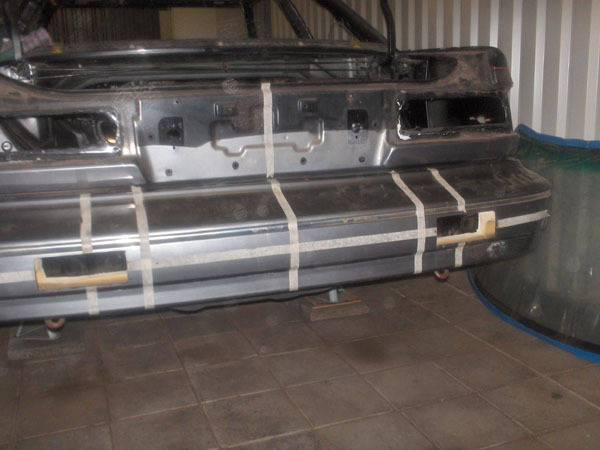 The rear bumper is made up of a heavy metal beam, with some foam-like material stuck to it and a outer 'cover' to cover it all up and make it look like a bumper. To create enough room for the fog lights, that stick out pretty far, I had to cut into all 3 layers. When the lights are placed in the bumper, I have to be able to operate them as well. The coupé didn't come with a switch to switch fog lights on and off. So I would have to incorporate that somewhere into the interior myself. I took the switch from a Corolla hatchback, that has the right symbol and is lit when the lights are turned on. So it should look pretty OEM when all is done. 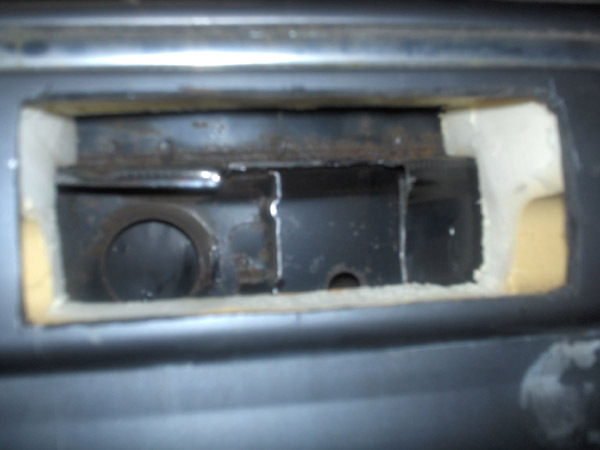 Getting the switch into the dashboard was just a matter of cutting out a hole of the right size in a part of the dashboard. I would sort the wiring out later when I would start with the entire wiring loom. Now that I had made some room for the actual lights to go in, I found out that the shape of the light bezels was just a little different than the shape of the Corolla bumper. The Civic bumper sloped downwards a little more, so I had to mod the bezels a little to make them fit. I just cut out some plastic along the top and sides so I was able to fold the upper edge back a little. The Civic bumper sloped down a little. By notching the bezel a little I was able to get it to fit perfectly. All in all, I was pretty pleased with how that came out and would have happily drove around with that. 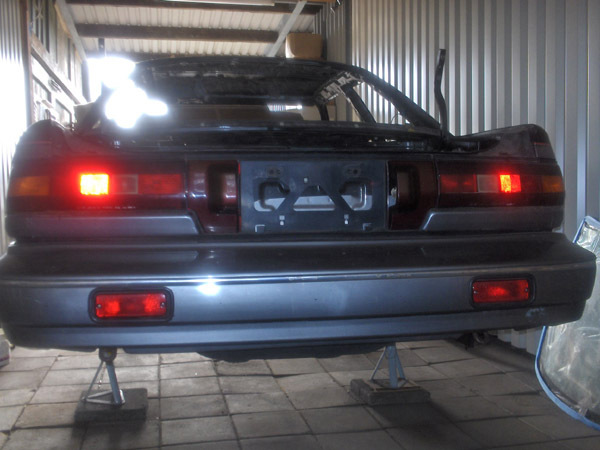 But then the plans changed and I flew in a much nicer rear bumper from Japan. I'm certainly not going to cut that one up. And as the planned use for the car has changed as well and I will no longer use the car for daily driving when it's done, I am certainly not going to drive it when it's foggy. So the chances of me ever going to use fog lights are pretty slim and thereby the plans for the rear fog lights were also canned. 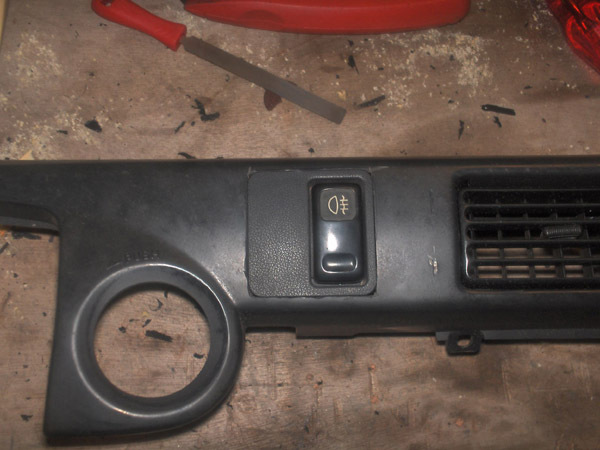 I already closed up the hole in the dashboard where the fog light switch would have gone and the USDM rear bumper parts have already been scrapped. So all the work on this page has in fact been in vain. But I had fun, did something different and gained some experiences so I call that a win.